You will be sure to enjoy riding in the Electric Power Kart 350 watt Go Kart powered by the sun. You are looking at a brand new solar powered Go Kart that goes 15m ph. We consider these karts to be the best and fastest (for their size) on the market. We have seen great results with these karts since the day we started selling them. These karts are great for children or adults. Playtime is about 2 hours! Integrated 4 watt monocrystalline silicon solar panel on the rear wing that continuously recharges the go kart while in use. It's powered by a 16Ah 24v battery pack and 350 Watt DC motor. Yes, the solar panel can also charge the go kart while not in use or with the battery charger in 4-6 hours. 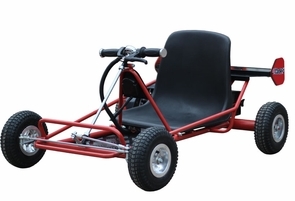 This go kart comes standard with 9 inch pneumatic tires for a variety of terrain and easy to use disc brakes. No sun? No problem as you can use the included battery charger. We carry all parts just in case and the solar go kart comes with warranty.